Gove not welcome at the Institute of Education | Bloomsbury Fightback! Here’s a report from an IoE student, about last week’s demo against Michael Gove, Tory minister in charge of destroying the UK’s schools. Having seen the protest posted on facebook, I went along last Saturday fuelled by hatred for Michael Gove, pleased to go and meet fellow haters and share my disgust that he would be invited to my university. I also booked a ticket to the all-day event at which he was the opening speaker. It was a small but vocal demo, with members of the IoE branch of UCU joined by students, teachers, and members of the Anti-Academies Alliance, who had their new ‘Gove-buster’ suits, with which they intend to harass him wherever he goes. The majority of the conference attendees were forced to wait in the rain as sponsors of the event and exhibitors (mainly private education companies) were allowed in first. 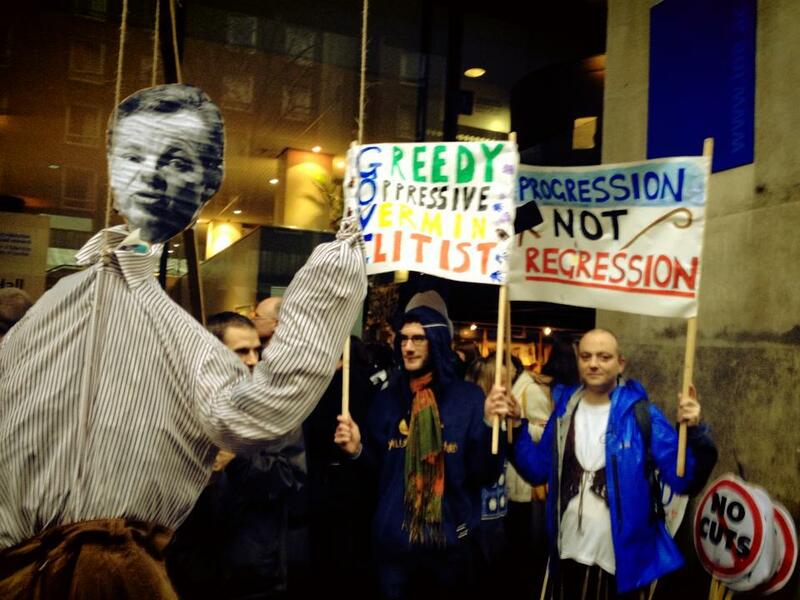 This provided a supportive audience for our armfuls of flyers and information, and appreciation for our home-made Gove puppet (‘you might think from his policies that this man is evil, but he is merely a puppet, with academy chains and private education companies pulling the strings…’). The event itself, an all day ‘Festival of Education’, was organised by ARK (the UK’s biggest Academy chain, set up by hedge-fund managers, along with TES and the IoE, with a large amount of sponsorship coming from the growing private education industry. If there was any doubt about the real motives behind the Academies programme, this event made it pretty clear, with the privatisation agenda well-represented in almost every session, including titles such as “does it matter if education makes a profit?” Currently there is little appetite for staight-up profit-making schools and the academy chains are having to make do with paying massive salaries to top management; outsourcing even more aspects of school life such as training, SEN support, consultancy etc; and undermining pay and conditions agreements, as well as financial shenanigans. However, there is a quite transparent pro-privatisation agenda that hopes for much more, and which the academies programme has taken a huge leap towards. This corporate arms-fair style event is clearly the future of education in Gove’s hands, and it is disgusting that the Institute of Education allowed such an event to happen on its premises given that Gove’s policy model repeatedly seeks to ignore academic education research in favour of the findings of his friendly policy think-tanks. It was heartening at least to know that I am not alone in my opposition. As Gove walked on, I was definitely not the only person booing, as Gove’s cosy interviewer David Aaranovitch was forced to acknowledge and try to make an awkward joke of it. When it came to questions and Gove was forced off his cautious script, the hostility felt by the audience became clear, with widespread heckling, derisive laughter, and outrage as he tried to tell an audience mainly made up of teachers that current teaching standards weren’t up to scratch. It was exciting to be in a room of so many people who shared my hatred for this scourge, but also disappointing, as one woman said to me afterwards, why did we listen at all, why weren’t we throwing eggs?